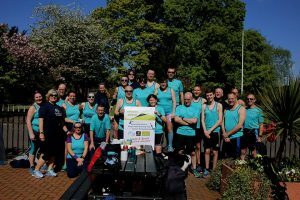 The 5th annual ‘mob-match’ between Bournville Harriers and Kings Heath Running Club will take place at Cannon Hill parkrun on 4th May, to remember our friend and BvH member, John Enright, and fellow parkrunner Darren Hale. The event raises money for the British Heart Foundation, with a bake off as well as the run. All members of club can contribute towards the mob-match as the scoring takes in both performance and participation – simply ensure that your parkrun profile has your club registered as Bournville Harriers for your run to count towards the team score. 1. The John Enright parkrun is an annual parkrun mobmatch held between Kings Heath Running Club and Bournville Harriers. 2. Each person who appears on the Cannon Hill parkrun results on the day of the mobmatch as running for Bournville Harriers or Kings Heath Running Club will score for their club. 3. Each person’s score equals the total number of runners on the day, minus that person’s overall finishing position. For example – There are 1000 runners at Cannon Hill on the day of the mobmatch. J. Bloggs is registered with Bournville Harriers, and finished in 100th position. J. will score 1000-100 = 900 points for Bournville. 4. The club’s score is the sum total of all scores from people scoring for them. The highest score wins the mobmatch. 5. To ensure the event has the necessary volunteer support, each team will provide an agreed minimum number of volunteers for the mobmatch. For the 2019 match, this is a minimum of 6 volunteers from each club. These volunteers do not have to be club members, or registered with parkrun as affiliated to the competing clubs – they just have to agree to participate in the club’s volunteering contingent. Each club will be offering cakes on the bandstand, and asking for donations in return. All donations for cakes and other donations received on the day will go to the British Heart Foundation. This entry was posted in Announcements by BvH Admin. Bookmark the permalink.